Wind is down and looks to be a sunny day. Slept well and sound through the night. Dreamt of my dog Jack running along besides me on the beach. Sea to Summit blow up pillow is the best invention ever along with compression socks. Got away at 7:15 for another long gruelling day of beach walking. The beach is long, stretching far out in front and it’s really difficult to gauge distance. You’ll spot something in the distance thinking it is massive, like a car heading towards you, but the closer you get there is no change, it’s not moving towards you….turns out to be a piece of seaweed or a bird. The tide was at it highest with waves washing up as high as they could to a vegetated sand bank. The bank itself was 4-5 m high with many lower blow outs interspersed. I avoided a couple of close calls of being inundated with the waves rushing in silently or much quicker than expected but was eventually beaten at this cat and mouse game by the sea. I couldn’t scramble up the wall quick enough with a fast moving wave. Under my body weight my perch collapsed as water spilled in underneath and the lower half of my right leg copped a soaking from the sea. To be honest there was not much to tell of the beach really. I was kind of expecting to see lots of interesting flotsam, some sea life like seals or washed up dead sharks or whale bones. But it was really quite boring. I know this is not always the case as I’ve read other trampers accounts of the journey and stories from the locals. The sand tread is very difficult on the feet, particularly towards the end of the day and the difficulty judging distance was hard on the mind. You would walk for what felt like kilometres only to glance at your watch or gps and realise you have only covered 2km or so and only been walking for 1/2 hour. It was tough but i kept telling myself it can only get easier each day. The body is holding out better today, particularly my shoulders which is great. Two things that did stick out today were. 1: The discovery of an old bike on the sand bank. Obviously abandoned with a blown tyre but still rideable with the drive chain all good. A bit if beach riding was called for but did not last long with the skinny tyres in the soft sand. The other was the ouster catchers finding Tau Tau (pippies) in the shallows, flying high, dropping them and repeating until they were broken open on the ground. Made it to Utea Park today having walked another 25km. 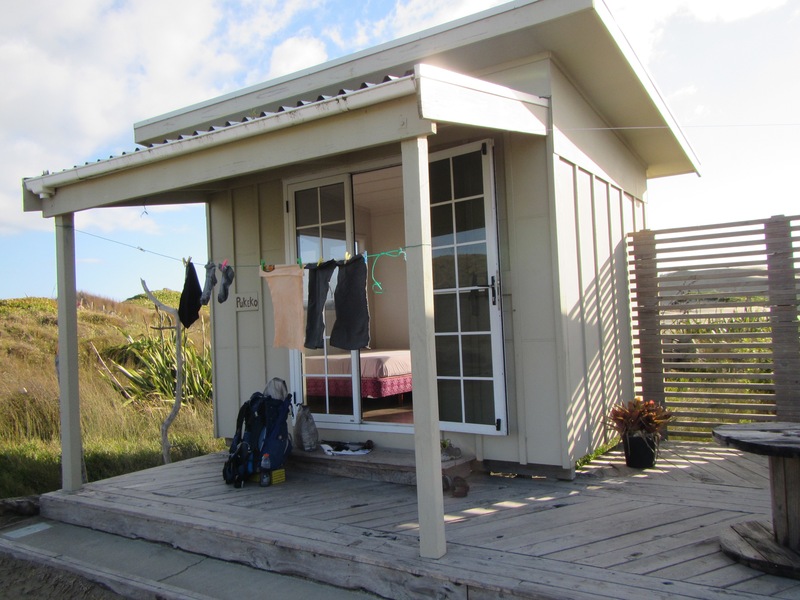 Utea is a family trust property with multiple small bunk units that trampers can stay in for koha (donation). They have hot showers, drinking water, kitchen facilities and flushing toilets. What an awesome spot and very generous of Paul and Tanya to share their property. And to top it off, a seasonal blueberry picker staying at Utea, Steven, handed me an ice cold beer. Great way to finish the day. On arrival, the young couple who I met yesterday were already at Utea, having must have passed me when I pulled up stumps yesterday. They filled up with water and pushed on. Gutsy but not for me. My feet say stop and so I did. Their next destination was another 17km on. Later, Bob, an older Kiwi TA tramper arrived at Utea. I passed him on the beach yesterday but he didn’t seem very talkative at the time as I said G’day. He was hoping for a shop at Utea to top up his sugar levels but found the camp to be just a camp. I offered him one of my chocolate bars which were in surplus. In buying food for the first leg I forgot to factor in the lunch that was provided by the tour bus to Cape Reinga. A warm shower and dinner. Bob picked up quite a bit and we got talking for a while. He’s on the TA down to Auckland before heading home to Dunedin. A mattress after a few days of lugging a pack was a welcome relief. Sound sleep would be had but still and early night. Shut eye at 7:30pm. Tomorrow I pass the 100km mark! The view of the stars out the cabin windows was amazing. Awesome effort Boris, I’m sure you’re looking forward to some firmer footing (off the sand). Keenly following your posts.